Scroll over the small photos in the strip above to see an enlargement of some of the various timber frame projects completed by LD Watkins. Use the blue arrow next to the small photos to see more timber frame homes. LD Watkins builds fine Timberpeg® timber frame homes for mountain environments in northern Colorado. Our homes are custom designed to suit you and your lifestyle. We listen to your needs and turn your ideas into concepts, turn them into a plan, and then a home, guiding you through the process every step of the way. We strive to create high quality, sustainable timber frame homes that are energy efficient and built to last. 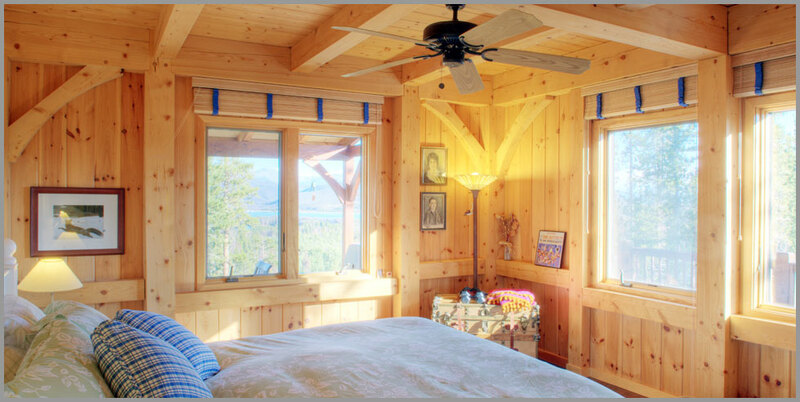 Our timber frame homes are handcrafted with Douglas Fir or Eastern White Pine. Our company provides in-house CAD design services to assist you in concept phase development or we can work directly with your architect. Les Watkins built his first Timberpeg home for Dr. Robert and Betty Williams of Winter Park Ranch through a referral from then Grand County Timberpeg Representative J. Warner. Our first Timberpeg was a success and we later went on to build a home for J. and Emily Warner. There are over thirty Timberpeg homes built in northern Colorado. Twenty are in Grand County and over ten of those projects were built by LD Watkins. By the time we complete a Timberpeg project we know the land, we know the house and we know the clients. For us, it is personal. We love our Timberpeg clients and the homes we build for them.